Margaret Thatcher: The trouble with Socialism is that eventually you run out of other people's money. As you read this pro-Trump book, a book that addresses the domestic forces working against President Donald John Trump and, therefore, the American way of life, you will gain a good understanding of his many successes since becoming our president and of his battles with anyone and everyone rattling his cage. I have known for years something isn’t right about the United States of America but didn’t know why I so thought. As the matter wore more and more on my mind, I embarked on a research project for the purpose of better understanding the country where I lived during the eighty years since my birth. Along the way, I documented and published my findings in four books with this book being the fifth. This writing came about because my six years of research has convinced me the people of the United States of America, including our elected officials, are manipulated by the biased liberal media. Further, I am firm in my belief the biased liberal media is motivated by one goal only, the goal of infesting the country with full-blown liberalism leading to an American form of socialism. As the reader, you will better understand how the biased liberal media works in an effort to convert conservatives to liberals and, in the process, has brutally and continuously attacked Donald Trump without mercy since the day he announced his candidacy for the high office of President of the United States of America. As with nearly everyone else, I do not know firsthand what goes on behind the scenes. My knowledge is limited to what I read and hear via television, radio, newspapers, magazines, books and acquaintances. Therefore, I cannot attest to the accuracy of the numerous quotations herein – quotations which support my perceptions, speculations and opinions. The biased liberal media has been out to destroy Donald Trump and his presidency from the beginning by tainting the minds of the people. In doing so, the biased liberal media has insulted the very people who gave the man a large electoral victory. While the biased liberal media plies its attempts at sabotage, President Trump has done an admiral job for the people, not just for those who put him in the Oval Office but for those who didn’t vote for him, including television’s blond babes and pretty boys along with other dunderheads of the biased liberal media. During his years as a very successful businessman, Donald Trump has learned very well how to focus on achieving goals by separating the wheat from the chaff. Trump is much like Timex spokesman John Cameron Swayze’s description of Timex watches via television a half century earlier: It takes a licking and keeps on ticking. Paraphrasing Mr. Swayze, Donald Trump takes a licking and keeps on ticking as well. Donald John Trump’s vision for the United States is truly one of making America great again. It’s a FORWARD EVER BACKWARD NEVER vision. Fire in the Belly - Donald Trump's Ride into Washington on a White Horse describes President Trump's rocky road to becoming our 45th president. 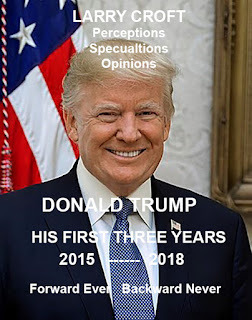 Presented are President Trump's positions on the issues as well as his bombastic style, his battles with the media and the Republican Party plus his harsh verbal attacks directed to anyone and everyone who rattles his cage. The author, who supports Trump 100%, explains why Trump is the right man for the Oval Office and why he believes Trump's positions on the various issues troubling the citizens of the United States are spot-on. At the end of the book, the author presents a scathing opinion titled: Why Hillary (liar liar pantsuit on fire) Clinton lost the election. Also, at the end of the book are more than 600 links to relevant sources, about 200 of which are referenced in the body of Fire in the Belly – Donald Trump’s Ride into Washington on a White Horse. Beyond any doubt, the United States is a nation with problems - problems leading us down the undesirable path taken by former great countries and in a direction I find very hard to accept. Few people were more disappointed than I was after the 2008 election to learn the people elected Barack Obama to become the 44th United Sates president. My displeasure prompted me to write and post 92 blog articles during a one-year period, (now removed) expressing my disagreements with the Obama administration and our Congress. This book is an edited compilation of those articles. It might appear to readers that I have hatred toward President Obama. Not true but I do have an extreme dislike for his ideology. Readers will find numerous excerpts and quotes (appearing in red letters) with links to credible sources. Please read the articles associated with these links in their entirety for an understanding of their full meaning as, admittedly, I have biases. When following links to Wikipedia entries, readers should refer to sources noted in the associated supporting references. 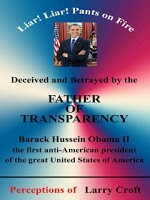 This book exposes Barack Obama, a man who deceived the people to get elected to the highest elective office in the United States by promising complete transparency once in the Oval Office and then betrayed the people with his efforts to replace the time-honored American way of life with American Socialism. Obama worked to fulfilll his declaration to fundamentally transform the United States of America and did so with numerous lies and scandals along the way. After reading this book readers will understand the true Obama. In a document titled, Transparency and Open Government Memorandum for the Heads of Executive Departments and Agencies, Barack Obama said his administration is committed to creating an unprecedented level of openness in Government. Now, after a little more than four years, he failed to produce as promised. My final thoughts on the way to my urn will be that I was on firm ground using the facetious moniker “Father of Transparency” to describe Barack Obama. This book contains my perceptions of the performance of President Barack Hussein Obama II, along with numerous excerpts of media reports, with links to the full readings for furthering your research, most of which show we have a president not to be trusted. His actions show it is not his intention for the United States of America to continue with a government of, by and for the people living in the land of the free and home of the brave, no matter what he says. The direction the United States moves today is shameful and will worsen if Obama and like-minded liberals succeed in their quest to grow, grow and grow costly government social programs. When you complete reading this book, you will be convinced that he and his liberal ilk are succeeding. How much money does the United States Postal Service lose each day? Why did the estimated cost of President Obama’s one week trip to Africa beginning in June, 2013 climb to $100 million? Who did the Obama administration falsely accused of causing the Benghazi murders? Which of Obama’s programs does the author refer to as Obama’s Edsel? 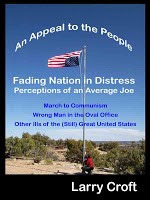 Why does the author believe Obama is an anti-American president? Why does the author refer to Obama as a ceremonial president? What was the subject of Obama’s pledge – a pledge he broke early in his presidency – to the people during his 2008 campaign? How much has Obama increased the national debt during his presidency? How much is each citizen’s share of the national debt? How many Pinocchios did the Washington Post fact checker award Obama for his incorrect comment about the pay of Capitol Hill janitors? What did Obama tell Dmitry Medvedev about the November 2012 election? What conservative radio personality said Obama is getting everything he wants? What country with a president/dictator controlled by the Muslim Brotherhood did Obama promise 20 brand new F-16 fighter jets in 2010? What was Obama’s one-term proposition comment about? How many scandals does Keith Koffler attribute to the Obama administration? Who said Obama may look like a wuss over Syria? What television news personality says Obama doesn’t like dealing with politicians? Who said: But we have to pass the bill so that you can find out what is in it, away from the fog of controversy? What country song does the author associate with President Obama? A jury found that fraud put the names of Barack Obama and Hillary Clinton on the 2008 presidential primary ballot in what state? When did Obama play it cool and do the greatest good for the greatest number? What is the al-Qaida connection with respect to the Benghazi attack? What unenviable situation does Obama share with Eisenhower, Nixon, Clinton and G.W. Bush? How does Peggy Noonan describe the liberal’s view of Obama? What is a pejorative term attached to people claiming Obama was not born in the United States? What are some reasons the media lavishes praise on Obama? What has Obama said that demonstrates he lacks business acumen? How are Obama and James Bond Stockdale alike? If Hillary Clinton runs for the presidency in 2016, will the media give her a pass as it did with Obama? What is the name of the person who authorized our government to develop and store what should be private information about any and all of us whether we are or are not suspected of engaging in illegal activity? Why is it said Obama is in the doldrums and the presidency in a dead zone? Some people will tell you this book of my perceptions is a disrespectful attack upon President, Barack Obama. Perhaps so as I make absolutely no attempt to hide my disrespect for Barack Obama’s performance - not the man but his performance - in his official capacity as a steward of our affairs. This is a must-read book. It is my appeal to the American people to become fully engaged in deciding the future of the (still) great United States of America. Otherwise, we risk losing all that has contributed to our greatness. In this book, you will read my critical thoughts and opinions about the restoring the United States to a land of the free and home of the brave with a government of, by and for the people – the country President Lincoln envisioned in 1863. This book addresses issues that have been prominent in the news - issues working Americans tend to forget while occupied with home, work and other responsibilities. Bringing these matters to the forefront in one book instead of in bits and pieces from different sources as they occur over long periods gives readers an opportunity to revisit forgotten issues and perhaps learn about issues for the first time. Reference to sources provided, along with further research, will help readers become sufficiently informed for making the right 2012 voting decision. 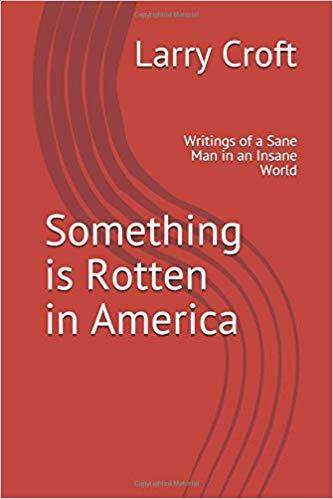 The general theme of this book - a book that presents President Obama and dyed-in-the-wool liberals as a group bent on transforming the United States of America from a country of capitalism to a country of communism - is the American voter's bubbling over apathy. Our apathy led to sending Barack Obama - a man unknown outside Illinois and a man with a very thin resume - to the highest office in the land with nothing more to offer than a promise of fundamentally changing the way we live using the campaign slogan "Change We Can Believe In." The issues at hand are serious issues. They demand no-nonsense attention. November 6, 2012 is the day to show our commitment. My hope is that, for the good of the great United States of America, conservatives tell the fat lady to sing a song during the evening of November 6, 2012, a song telling President Obama and other liberals their destruction of our country is over. Lew Barry, a nationally known radio talk show host, news columnist and public speaker of inherited wealth visits the powerful Baxter Perry King at King‘s request. Once there, he meets retired three-star U.S. Army General Fred Sparks, renowned for having brought down a terrorist leader who was the single greatest threat to the United States. The three engage in a serious discussion relating to advance knowledge King and Sparks have about a group that will cause the most damaging act of terror ever thrust upon the United States. Barry learns King has been hired by the U.S. government to capture the group. King, in turn, hires Sparks, who owns and operates a terrorist survival training school. 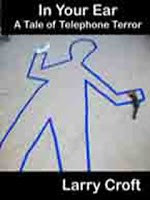 Then Barry learns what the citizens do not yet know: a terrorist group known as IYE (In Your Ear) has effectively shut down a Cleveland call center by inflicting telephone operators with tinnitus during telephone calls. Further, intense fear exists in high places that IYE will “infect” telephone lines throughout the country, causing the citizens to shy away from telephones. Knowing such a fear will bring the wheels of commerce to a crawl, King and Sparks solicit Barry to infiltrate the group by using his radio program as a vehicle. So Barry, a former U.S. Navy SEAL, looking for a return to the center stage of action and intrigue, accepts their offer. But soon he has second thoughts as he becomes concerned with risking the safe and comfortable lifestyle he has established for himself and his family over the years. Barry’s hesitancy is proven to be well-founded, as his rash decision soon thrusts him into more danger than he’d ever bargained for in this thrill-a-minute action/ adventure…where nothing is ever what it seems. Larry Croft served his country as an aviation electronic technician in the U.S. Navy during the period 1955-1959 and, after returning to civilian life, has worked as a computer programmer, accountant, auditor and fraud analyst in the transportation, forest products, insurance, advertising and banking industries. In addition, he pursued his interest in aviation by earning a commercial pilot license with both flight instructor and instrument flight instructor ratings. Croft graduated from Redkey, Indiana High School in 1955, Indiana University in 1975 and Arizona State University in 1993 with degrees in business and accountancy respectively. He has been licensed as a Certified Public Accountant (CPA) in Indiana and Arizona. As with many people, he spent most of his productive years disengaged from the world of politics with the erroneous belief competent and honorable men and women determine the direction of the United States of America. After his 2007 retirement and stunned by the shenanigans of politicians – mostly Washington politicians – Croft acquired an interest in following the actions of our elected officials almost to the exclusion of all else. Croft describes himself as a “card-carrying” fiscal conservative who believes the only legitimate role for government in a capitalistic society is, with very few exceptions, administering programs private sector businesses and able-bodied citizens cannot do for themselves. He champions maintaining a strong defense and a sound infrastructure for the safety and comfort of its citizens. He believes entitlement programs and government meddling with free enterprise contribute to a capitalistic nation’s decay. Croft and his wife, Wanda, relocated from Concho, Arizona to Cotacachi, Ecuador early in August, 2018. I get this question a lot. Here’s why. People say this about America: If you don't love it, leave it. That’s where I am. More specifically, I’m fed up with the direction the country is going – a direction brought about by the growing infestation of liberalism. My wife and I visited Quito, Ecuador in 2005 and still like everything we remember, especially the low, low cost of living. American voters will continue sending What's in it for me? politicians to Washington. After Trump leaves the Oval Office, whether one term or two terms, American voters will enthusiastically send an ultra-liberal replacement with high hopes that the government will grow more than ever with costly social programs. Metaphorically speaking, the country will be like a house without a dog; it will not be a home. I have paid federal and state income taxes since 1955 – age 17, 63 years ago – and since retirement, I realize I get customer service quality from Washington ranking a mere 1 on a scale of 10, about the same as from private sector customer service call centers. Not a good return on investment over a 63-year period. People tell me the Ecuadorian government is no better than the flawed United States government and I will not better my lot in life. These are people who, without exception, belittle Ecuador just before snickering and walking away without extending to me the courtesy of an intellectual discussion. Perhaps they are right but I’ll take my chances. I have followed United States politics at the national level since retiring. I strongly believe I am much more informed than the typical person on the street regardless of his or her station in life. I have researched the Ecuadorian government structure as well. I have been rewarded very well living the American way of life with veteran and social security benefits, including Medicare, along with the conveniences, safety and security we all enjoy. Employment in the private sector has rewarded me well for the most part too. However, in my blissful ignorance and like many people today, I paid absolutely zero attention to current events in and out of politics. If ignorance is bliss for me in Ecuador as it once was in the United States, then, good for me.